Andrew Lattimore and Sam Durning have joined the team as claims handlers, while Stacey Sneddon has taken up the role of litigation secretary. 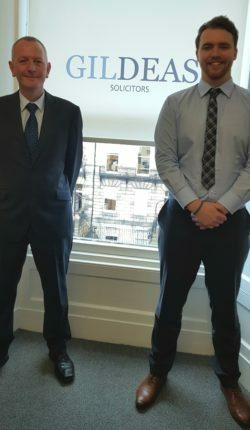 Andrew, pictured on the left, moved from London to Edinburgh in 1987 and spent more than 20 years with CIS Insurance handling motor, household and personal injury claims. His career also includes spells with Gallagher Bassett, Topmark Claims Management and Aon Risk Solutions. Sam, also pictured, is originally from Ayr but moved to the capital in 2013 to attend university there. After graduating from Napier with a degree in Law with Business Management, he worked in recruitment and most recently at Standard Life before joining Gildeas. Stacey is originally from an accounts background but moved to Australia in 2008, where she worked as a legal secretary. Since then she spent the majority of time working in the personal injury field and returned to Scotland in 2017.